I'm doing a repeat for you today - you will want this recipe! I often make these bars for functions this time of year and they are always a BIG hit! I'm always asked for the recipe. 1. Heat oven to 350 degrees F. Grease 13x9x2 in. baking pan. 2. Combine flour and brown sugar in large bowl. Cut in butter until mixture resembles coarse crumbs. Add egg; mix well. Stir in 1-1/2 cups chocolate chips and all the nuts; set aside 1-1/2 cups mixture. 3. Press remaining crumb mixture onto bottom of prepared pan. Bake 10 minutes. 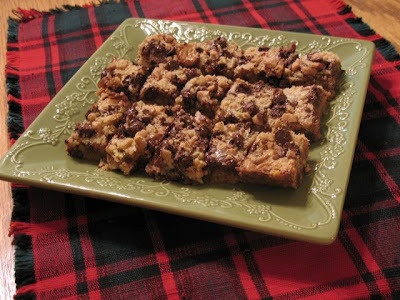 Pour sweetened condensed milk evenly over hot crust; set aside 1/4 cup toffee bits. Sprinkle remaining toffee bits over sweetened condensed milk. Sprinkle reserved crumb mixture and remaining 1/2 cup chocolate chips over top. 4. Bake 25 to 30 minutes or until golden brown. Top with reserved toffee bits. Cool completely in pan on wire rack. Cut into bars. About 48 bars. Cut them small - because the "Rich" part of the title is no exaggeration! I'm linking this up to Tasty Tuesday at Balancing Beauty and Bedlam and to Do-it-yourself Day at A Soft Place to Land! Find more chocolate on my "Just Chocolate" recipe index! Subscribe right here if you don't want to miss out on delicious Chocolate Friday posts. Have a fabulous Friday friends!! Yum-O! Nice to see these are made in a 9x13 - easy to transport! Have mercy girl. Those look sinfully delish! Big Wow it's early and I got nothing size hugs to you! Anything with toffee and I'm there! YUM!